I've only recently become interested in this notion of non-official Transformers: fans repainting their figures, modifying or enhancing them with new parts shaped from other toys, or even fully scratch-built robots. It's tremendously impressive, and also enviable since I have no such talents that way. I'm a coder, not a fighter -- er, craftsman. Hell, I'm impressed with myself if I can replace a brake light in a car or fix the toilet. I can expertly apply stickers, but cobbling original Transformers is a bit beyond me. And, for whatever reason, these fan-built creations continue to get increasingly impressive every year. What's really interesting now, though, is the emerging field of mass-produced unofficial Transformer merchandise. I already showed you the Quintessons I recently acquired, but what I got in the mail over the weekend easily tops them. It's so awesome, I've found myself randomly smiling throughout the day when I remember that he's home waiting for me on my desk. How do I introduce the history of this item as succinctly as possible...? ... that changes into a robot, and his trailer transforms into a mobile base. ... that combines with his car-carrier trailer into a large robot. 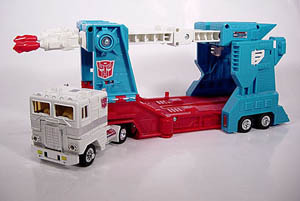 Except, see, the actual cabs of the two are identical and if Ultra Magnus didn't feel like combining with his armor he could just transform into what is essentially a white version of Optimus Prime. 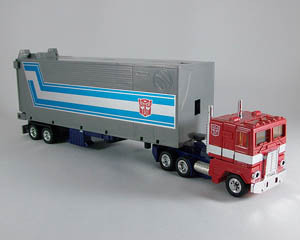 In fact, that's exactly what myself and every other kid thought the first time I held his box in my hands: "He's a white Optimus Prime who combines with his trailer. Why is he a white Optimus Prime?" This was rendered a slightly moot question because neither the movie, the cartoon, or the classic comic books ever showed Magnus wearing anything other than his fully combined (armored) form. Thus his existence as Great White Optimus Prime was a sort of open secret. 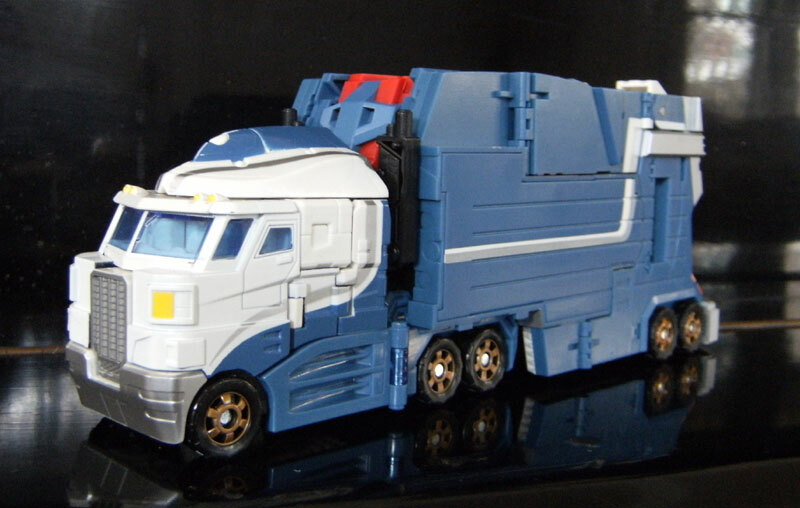 However, in recent years Hasbro has started taking their various Optimus Prime toys, repaiting them white, and re-releasing them under the name Ultra Magnus. And I gotta tell you, it feels a little like cheating, like being handed a bag of peanuts and told it was peanut butter. Usually I leave these albino Primes on the shelf. 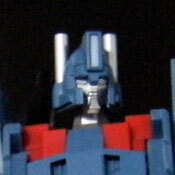 But luckily I did happen to pick up the Classics version of Ultra Magnus, mostly because he came packaged with another more compelling repaint (Skywarp). 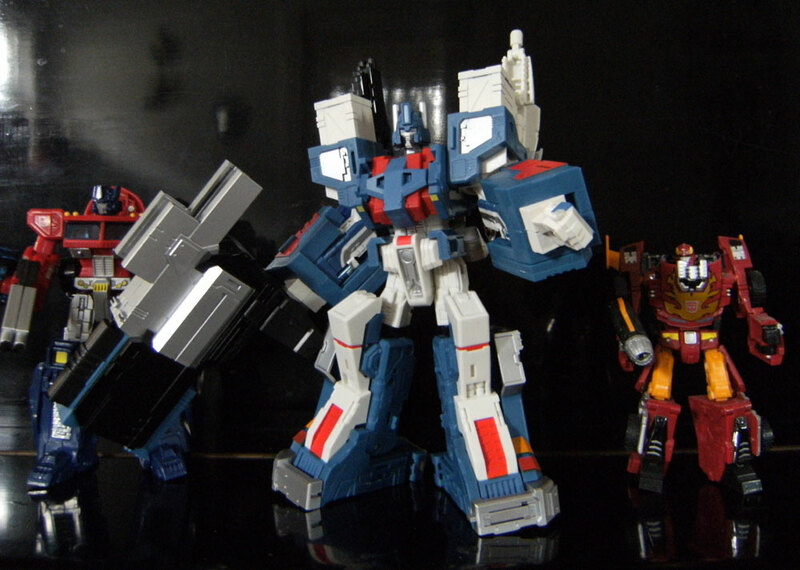 That's him, below, between Hot Rod (right) and the Japanese version of Prime (left). Professionally manufactured in China, sold online only, and labeled as "City Commander" for reasons of legal discretion, it is the most ambitious fan-crafted Transformer product yet. And the fandom loves it. It was sold for about $77, so I had to sell a number of less-loved toys to afford it, but it was totally worth it. In Transformers terms, this thing feels historic. The plastic texture, the colors and the weight of the piece all feel completely natural with the official robot. 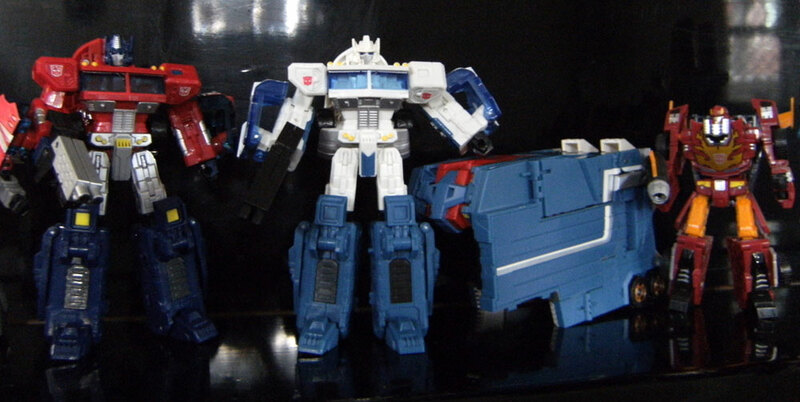 It serves to not only validate Magnus as a part of the Classics line, it actually rockets him to the forefront of it. All I have to do is add some Autobot stickers. Magnificent. Of course, all of this has got me thinking about a real, custom Botch toy again. When I went to CybCon a couple months ago, I met Hal Zucati, the man behind Rabid Squirrel, the company that produced transforming Arcee toys under the legalese name of CyberFembot. (Arcee was a female Transformer character that figured prominently in the cartoon but was never given a toy in the 80's.) He was aware of the Botch kitbash that someone else made as well as the digital renders upon which it was based. He suggested that a low-run of Botch toys could be done if enough people were interested in buying one to offset the cost through quantity. He guessed about $100 each, with a minimum initial investment for me of a few thousand. This seemed rather excessive, to be honest, and while I'm amazed by Hal's creations, I think the quality of the Quintessons and this City Commander armor are much more impressive as well as cheaper. Plus, as much as there seemed to be generally positive reaction to the Botch renders and kitbash on the discussion boards, I'm not sure how much people would actually be willing to pay for a small fan-created cassette character, no matter how sweet it is. $30? $50, tops? I have a history of over-estimating other people's interest in the things that really fascinate only me. So maybe I should just commission one of the kit-bashers and scratch-builders to build a single unique Botch for me with the option of doing a few more for equally interested parties. Sounds like you need to outsource to China like the rest of them. The high costs of fan creations are indeed a problem (and, indeed, why I still haven't gotten the City Commander, let alone those ARCs), but I certainly don't know how you'd make them cheaper without sacrificing quality. 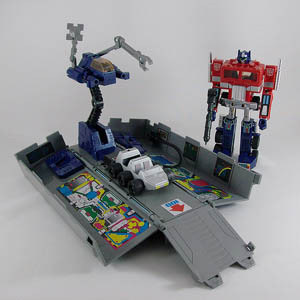 That is definitely one of the coolest Transformer fan creations I've ever seen. 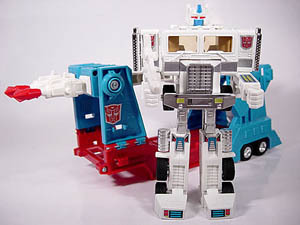 I always wondered why more wasn't said about Ultra Magnus being a white Optimus Prime, and more interestingly, has anyone ever put his armor on the G1 Prime? 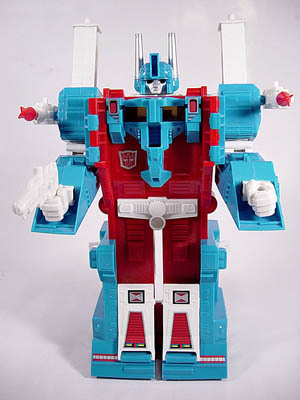 >> has anyone ever put his armor on the G1 Prime? I'm sure, but it would hardly matter, you can't even really see the cab portion in combined mode. Of course, when you consider that the whole thing comes from Diaclone, in a way, Optimus *is* Magnus and they share the armor. Or something. No one cares. The City Commander armour's awesomeness so overwhelmed me that I had a headache from the blood rush to the brain after I continuously assembled and disassembled him.